On Parnell Road, at the former site of St Mary's Anglican Church, at least some of the church's history on the original site is preserved: a single surviving gate pier, with a heritage plaque on it. The original St Mary's looked like this, and then this, and then like this. Initially there was a wooden church on the old site, dating from 1860 and designed by Frederick Thatcher. But, it was inadequate in size, as St Mary's was the only Anglican church in Parnell, which was a focus of diocesan activities right from the days of Bishop Selwyn. 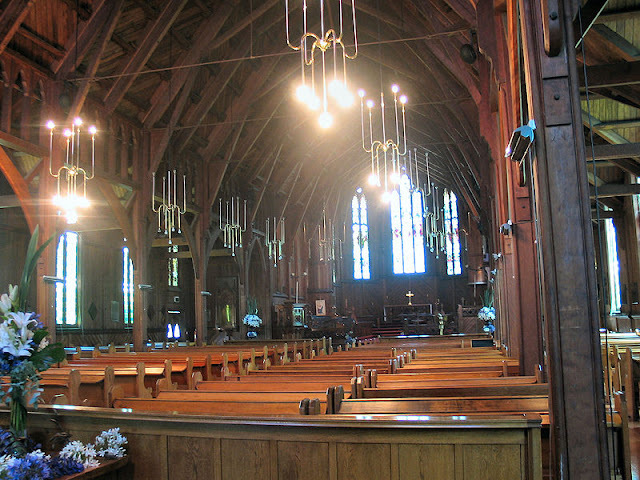 It was effectively the pro-cathedral church for the Anglican Diocese. Christchurch architect Benjamin Woolfield Mountfort was appointed in February 1885 to come up with a design for the replacement church, built by W Rosser and consecrated in September 1888. The old church was still used until its demolition in 1898 to make way for “four complete new bays to the nave, with a vestry for the clergy, baptistery, north and south porches, on the same level as the present nave, and a lower vestry and verger’s store, in the basement, which extends partly under the west end of the church”according to the NZ Herald, 11 January 1898. Mountfort was again the architect, but he died before the completion of the work. Discussions on proposals to move St Mary's across Parnell Road to the always-intended cathedral site began in earnest from 1938. The Bishop at the time in 1961 had said that it wouldn't be moved, that the church would go ahead with plans to build a cathedral on the intended site anyway. Holy Trinity was dedicated in 1973, and from that point St Mary's ceased to be the Cathedral Church. But, the cathedral complex remained still unfinished by 1980; moves began again to arrange to shift St Mary's. Two years of debate ensued, especially involving the local community, and many were dismayed by the prospect of the shift. However, in 1982, it took place. Today, St Mary's serves as a ladies' chapel. There's an image at the Auckland Library's site of the former interior, and here is today's (via Wikipedia). What a beautiful church. Benjamin Mountfort was a force unto himself. Some fantastic work did that fella produce! Gave Canterbury it's distinct buildings he did. Including one of my absolute favourites, the Canterbury Provincial Council Building. Love that place.